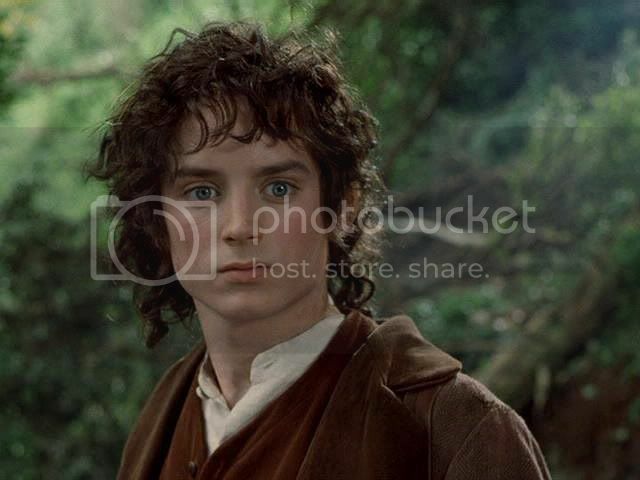 I thought it was high time for some more Frodo screencaps, so here they are. Originally, I hadn't planned to cap this sequence from the "Get off the Road" scene, because I thought there were several very nice caps already available at screencap galleries. But, last night as I paused my way through it, I sighed, resigned: they were too beautiful. I had to have them. 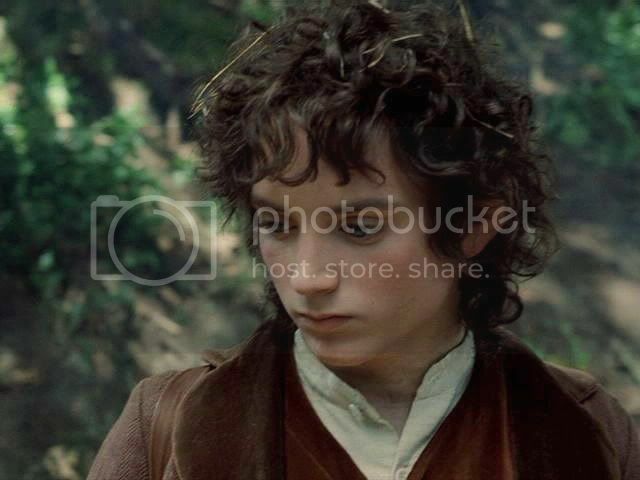 Actually, I have read several fanfics in which Frodo is compared to a deer. 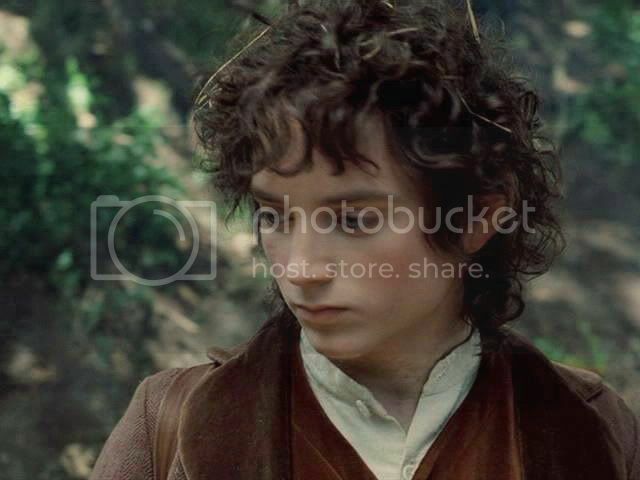 I read a lovely drabble once in which Bilbo saw newly orphaned Frodo standing before him like a fawn, very still, tentative, as if poised for flight. These screencaps amplify a deer's attitude of alertness, of sensing, of listening. Not only is the attitude much like a deer's, the sort of beauty his face exhibits reminds me of a deer's in these screencaps: the planes of his face strong and clean from the good bones underneath, the finely-delineated musculature covering it, the very large, very intelligent eyes and long dark lashes, as well as the broad forehead. 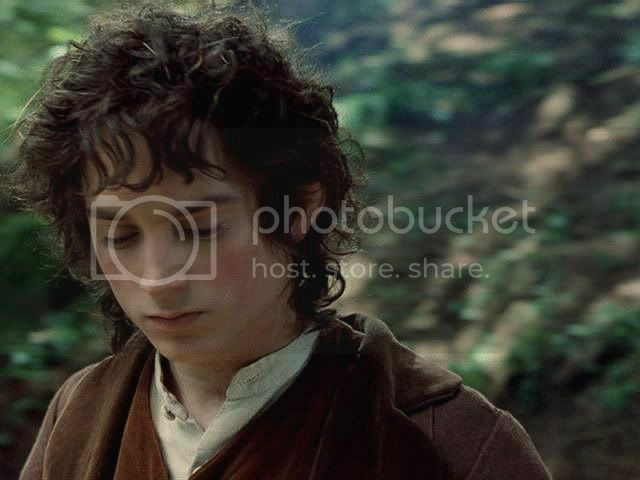 And, in these 3/4 views, Elijah Wood's jaw, which is notably wide and square from the front, is obscured so that the "deer-like" look of his face is enhanced even more. The resulting triangle-shape of his head makes his eyes and brow look that much more prominent, the nose that much more delineated -- all tapering down to the chiseled chin at the triangle's apex. Can you tell I've spent a lot of time looking at these? Yes, I think they are exquisite and he is exquisite in them. How can a face look so delicately made and yet so strong at the same time? How can a character be so fine and yet endure so much? 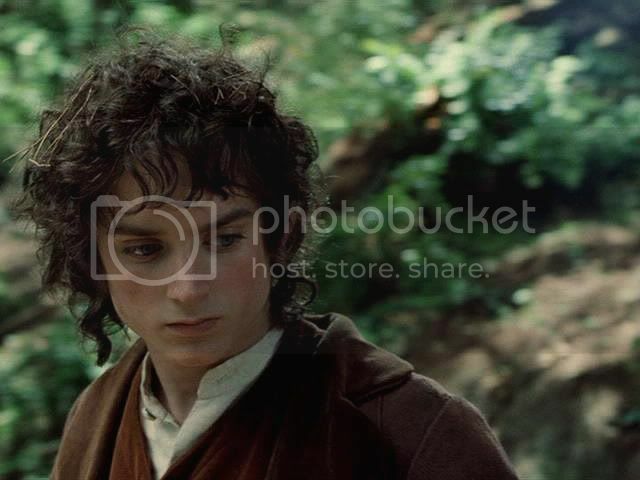 In "The Faculty" thread at K-D, I once compared film-Frodo to bone china. Bone china is beautiful, and very finely made. It is so thin it is almost translucent -- light passes through it. Yet it is able to take a beating other sorts of table ware cannot. My own handed-down bone china has been repeatedly whacked and dropped, yet it remains unscathed, still glossy and beautiful. A sort of patina of fine lines has formed on the surface from years of use, but it only adds to the china's beauty. My cheaper, coarser stuff, which looks sturdier, simply can't take that sort of punishment. Eventually it is chipped or cracked or broken. The "quality stuff," however, just keeps on going. Mews wrote in a comment below, He looks so fragile, but he's strong as tempered steel. 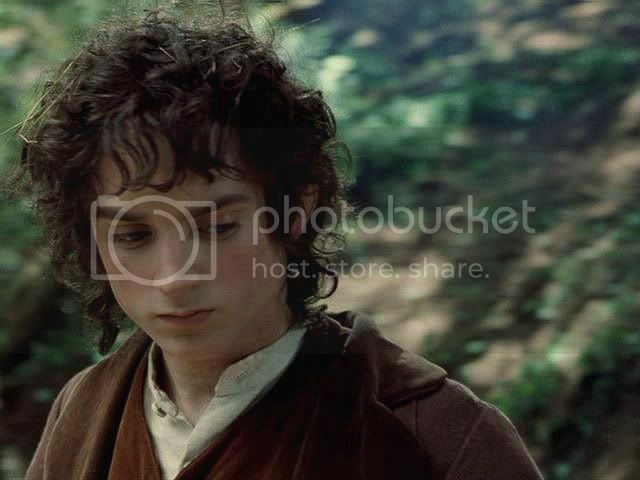 This made me go back through "Frodo screencaps" tags to find the entry I made a few months ago, in which I posted the half-dozen frames that come right after this set, when Frodo suggests they get off the road. Because they are so much a part of this series, I am re-posting them here. These frames exhibit that "tempered steel" sort of strength. You can sense it gathering itself under the beautiful surface. These screencaps amplify a deer's attitude of alertness, of sensing, of listening. I love that. And I love this scene. Ohhh, thank you (and hugs for Mews) for adding the additional caps. How wonderful. Yes, three cheers for Mews! It was very good to combine the sets. Mews, thank you. Yes, it's a face in a million, and PJ and the make-up/lighting team knew how to make the most of it. Your notes on the lighting were well observed. We've gushed in previous screencap entries over the way he seems to pull in the best of everything: luxurious surfaces and colours (lots of soft hair, satiny, flawless warm-ivory skin, rosy cheeks and lips, the rich dark chestnut of the hair, the astonishing blue of the eyes) AND chiselled strength in the bones and muscles beneath it. He looks so fragile, but he's strong as tempered steel. Because of your remark, I had to scroll back and look at the screencaps from the next part of this sequence, which I made a couple of months ago. The last cap in the series has such strength, I decided I would add those caps to this entry, here, even if it is a little redundant. 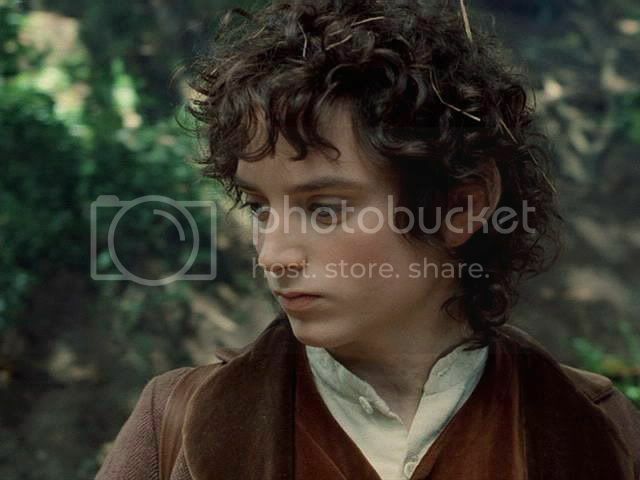 The idea all started when someone on a thread was saying how fed up she was with critics calling film Frodo pretty but weak -- fragile, breakable, like porcelain. (Well, the critics had a lot of help from PJ, Walsh and Boyens, but never mind that!) That made me think of bone china, a hard-paste porcelain with bone ash added to it, which gives it excellent tensile strength, even when made very thin. The stuff I received has worn beautifully. That film critic had meant the comparison ill, but I could see that it was really apt, more than the critic would ever guess. When I thought of how bone china was even translucent, too, it made my skin prickle. Perfect, I thought. So, nyah nyah nyah on that critic. Keep doing this. Staring at the screencaps is such sweet pain... and I so enjoy that you take what I see and feel in my marrow and put it into words. The beauty of that face caught forever in it's perfection for us in that split second in time. How can ANYone with any concept of beauty not be ensnared hopelessly by it? Thanks for giving me a place to stare and gush. It needs doing... seriously. I am so entertained that I am not the only one who sees a deer! What is this? Some kind of hive mind? Oops.. didn't realize I wasn't logged in. This is taerie in case you didn't recognize the drooling. 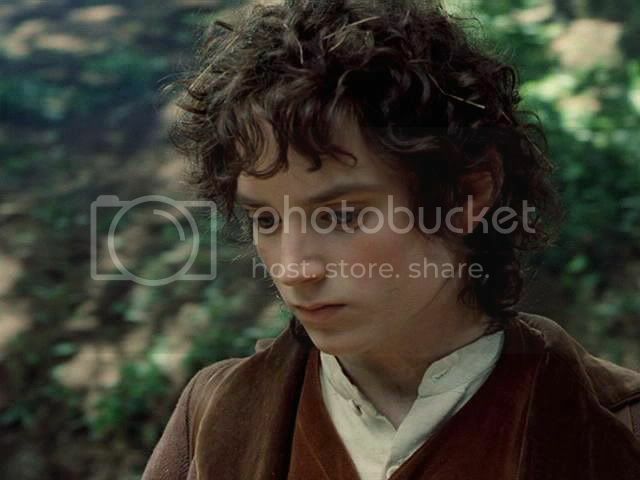 If you scroll down, you will see the drabble I was talking about (in which Bilbo saw young Frodo as like a deer), posted in Pearl's comment. Now that she has posted it there, I've asked her if I can go back into my entry and post it where it belongs. You know, your own illustration, the one I posted and which you use as an icon, has a very "deer in the woods" quality to it, too. Very still, very beautiful in the midst of the woodland flora, but filled with latent energy. Thanks for expressing so much pleasure in the screencaps, Taerie. It makes it that much more fun to find and post them. Are you planning to slather it all over him? That's Book Frodo for sure. 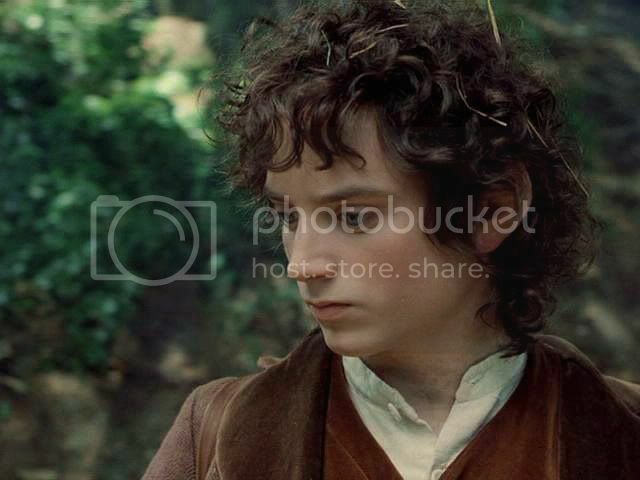 But the supremely beautiful Film Frodo also conveys that beauty of soul. 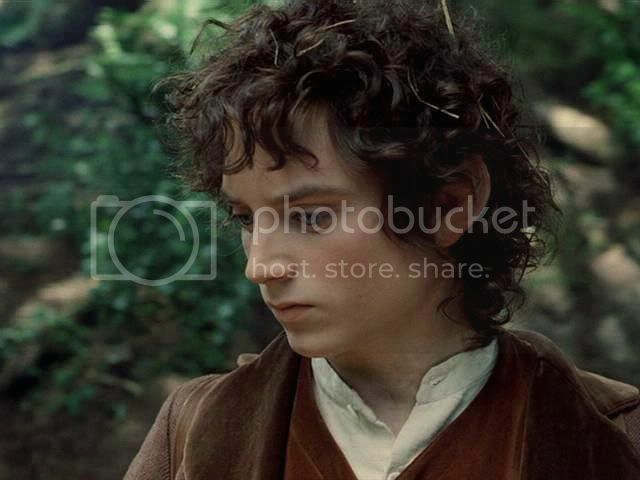 I read a lovely drabble once in which Bilbo saw newly orphaned Frodo standing before him like a fawn, very still, tentative, as if poised for flight. Many generations of hobbit-children have been enchanted by Gandalf’s tales, sitting expectantly on Anduin’s banks or, centuries later, by fireplaces in cosy smials. Gandalf fondly remembers little Bilbo, eyes widening in wonder at a wizard’s smoke-rings curling into dragon-shapes and swan-ships. Now, in Bilbo’s parlour, a hobbit-lad approaches Gandalf shyly, like a deer in moonlight, tense and graceful. 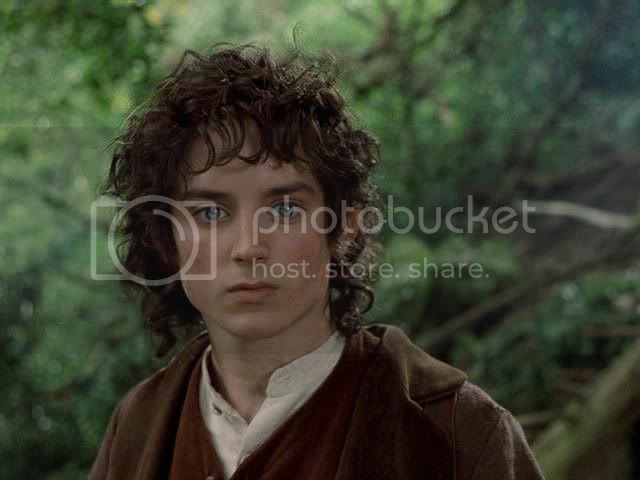 This Fallohide boy seems as supple as velvet but Gandalf senses iron within. 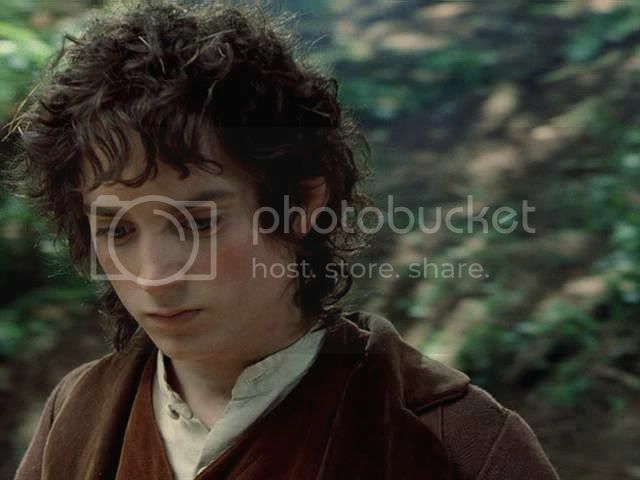 Frodo holds out his hand. ‘I’m Bilbo’s heir, sir.’ His eyes glow as deep as the Mirrormere. Lamby, lamby! You posted it! That was the exact one, the one that I gushed over in the Harem months and months ago. I didn't want to say more without speaking to you first, in case you really hadn't liked it, after all. May I post it up in the entry itself? Few will see it down here, and it's so beautiful and apt. Perfect, really. That boy would surely grow up looking the one in these screencaps (or the one who approaches Galadriel in Lorien, even more?). 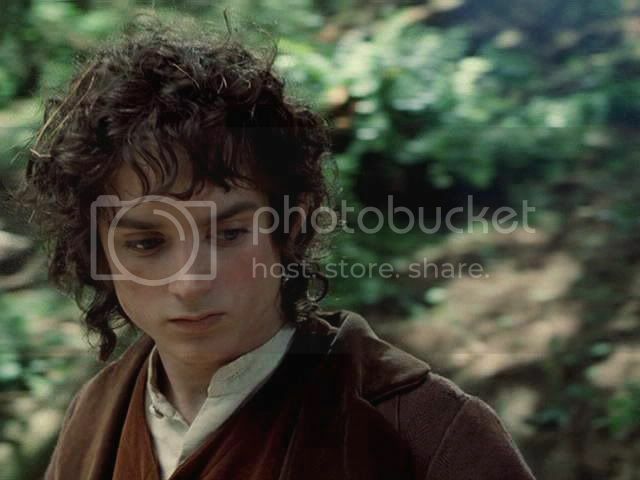 I think this is the most "beautiful" sequence of Frodo in the whole film. There are many lovely scenes, but he's other-worldly gorgeous here. Mariole, lovely, aren't they? "Lovely" - well, that's DEFINITELY not a strong enough descriptive. "Other-worldly gorgeous" is much more on target. Mariole, which scene is your icon from? Amon Hen? Or some other woods? I've been looking for the source of an isolated image (posted a few entries back) that is SO familiar, but I can't quite place it. I am wondering if it even is in any of the released versions, but is instead from unused footage. It's the one with the lyrics of "Into the West" printed over the lower right-hand quadrant of it. If you look at it, see what you think. Thanks! Yes, this is from Amon Hen. Another series where he's absolutely gorgeous. I had a tough time picking the image to use! I know the picture you mean. You can stop looking, because it is not in the film. (Or in the extras, which I have viewed.) I believe it was released only as a publicity photo. Sorry! These caps are beyond beautful, thank you. 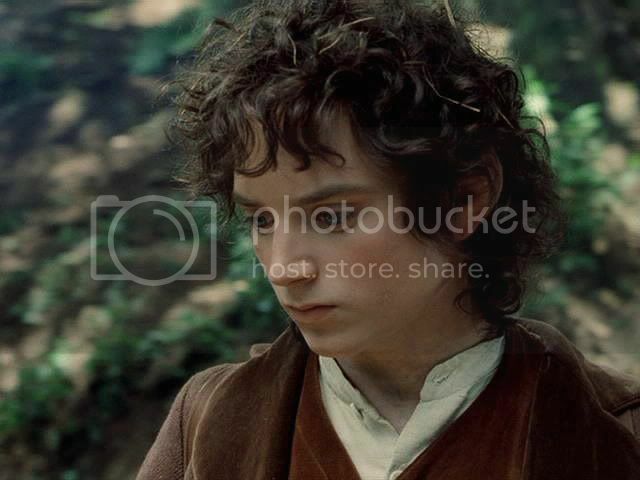 I love the way you describe Frodo/Elijah’s beauty in paragraph five. It made me go all a tingle when I read it. You posted something quite delicious, I remember, at the Harem when you first arrived. 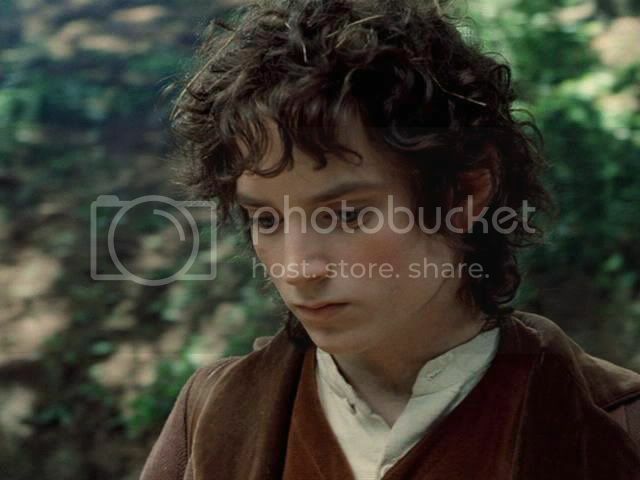 You posted an image of Frodo clutching an envelope containing the Ring and described in a very sensuous way how his fingers caressed that envelope. P.S. Este, I emailed you back about the glitches in the caps links. I opened the "seated at the Party; two smiles," though, and the caps were there for me. Hunh! Perhaps if you were looking several hours ago, it might have been the moment when I had taken that whole set down from the Photobucket, because I had tweaked the exposure. Those sets were all very pale, I noticed, from back when I was under the influence of "The Dark Monitor." Though I can see all the others “Ridiculous Thoughts” etc. Darnit, here come the tears again. Who LOOKS like that? Hi Mech, it's Eresh. Lovely screencaps, these. I've been too busy writing to do much visiting on the boards, but I needed some inspiration during the long, hard road of revision. These screencaps do just nicely. It's funny how you can tell he is still so young here--wasn't this the first scene shot? He will always be handsome, but here he is absolutely lovely, as only boys right on the cusp of manhood can be. Don't get me wrong, BTW. I also really, really like when they turn into men too. Whoohoo! I'll visit again soon when I need inspiration. Thanks for taking the time to make these caps, Mech. I just hope TOL appreciates all the devotion you heap upon him. Ereshkigal, how lovely to hear from you! 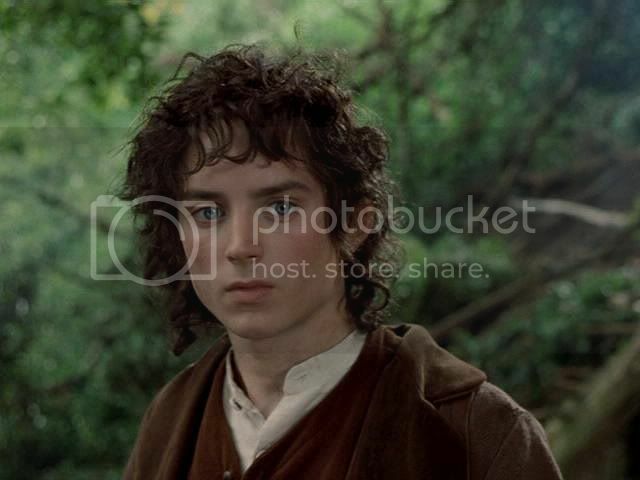 Yes, he was beautiful in the earliest parts of the shoot. 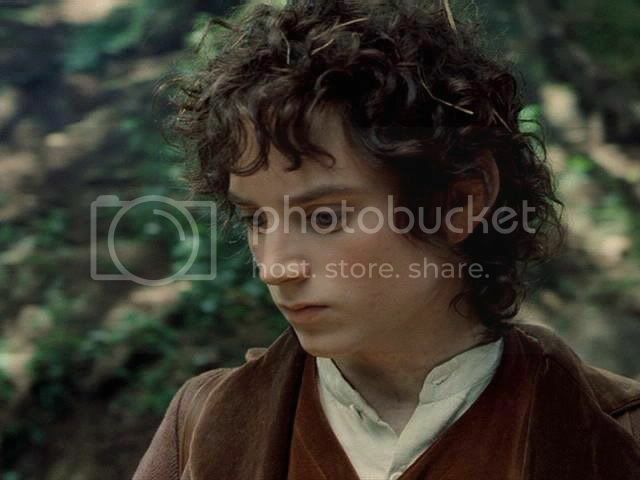 It was his Frodo of that period that most made me swoon with art-and-and-lust pleasure -- "as only boys right on the cusp of manhood can be," as you put it so beautifully. Although some boys are all pimply and have rudimentary breasts at that age, LOL. I hope you noted the link at the bottom of the series. I have made a table of all the screencap entries. I keep the link in the "Links" list to the left of each LJ entry, but some people don't know that such things exist. 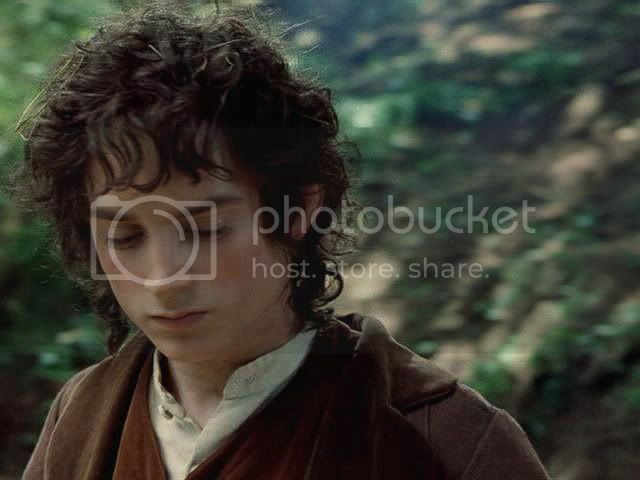 So I started to just put a link notice at the bottom of every screencap post (just like I do for the Art Travesties). Have you see the latest Art Travesties? I slowed down making them quite a bit, but my technique really improved after receiving a new program at Christmas. I even have gone back and redone a couple of the first ones which always bothered me.